1) The LAYOUTREGENCTL command can improve performance by controlling how the display list is updated in the Model and Layout tabs. By default each tab is set to completely regenerate each time a switch is made to make a tab current. This command setting allows a user to scale back the regeneration process to only include those display items which were modified since each tab was last made current. 2) This same command can be found in the System tab within the Options dialog box under Layout Regen Options. Type options in the command prompt to bring up the Options dialog box. a. The top option which reads Regen when switching layouts is the default setting and will result in all tabs being completely regenerated each time tabs are switched (this is value 0 when typing the command LAYOUTREGENCTL). b. 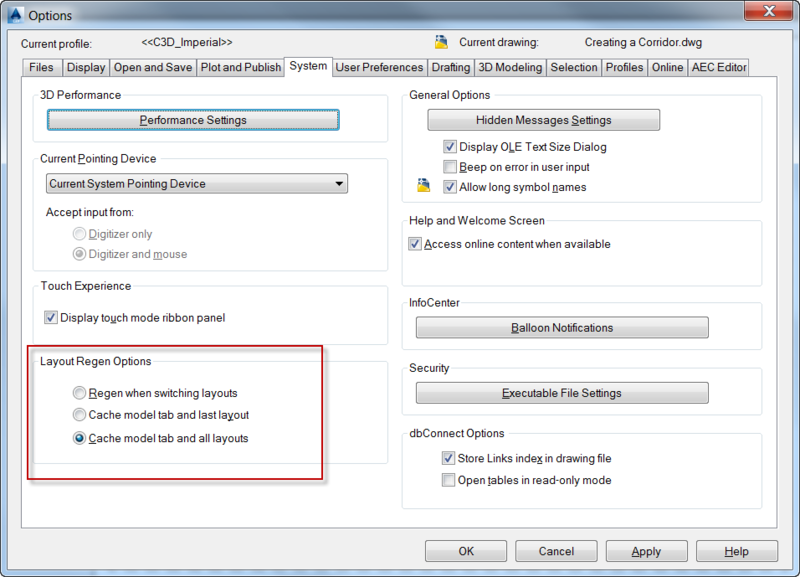 The middle option which reads Cache model tab and last layout will cache just the model tab and the last layout tab made current (this is value 1 when typing the command LAYOUTREGENCTL). Only display items that have been changed will regenerate for these tabs. 4) Type WHIPTHREAD into the command line to initiate the command. a. Setting 0 is the default and uses only a single processor. b. Setting 1 will distribute the processing of the drawing Regeneration across two processors. c. Setting 2 will distribute the processing of the Redraw operations across two processors. d. Setting 3 will distribute the processing of both the drawing Regeneration and Redraw operations across two processors. Hopefully these setting adjustments will help you save time and increase efficiency while working in Civil 3D. Thanks for sharing such an useful information from last many days speed and performance decrease to much but not after applying this steps it help me and i have increased performance.